Lucky Stars Video Slot Machine - Casino Answers! 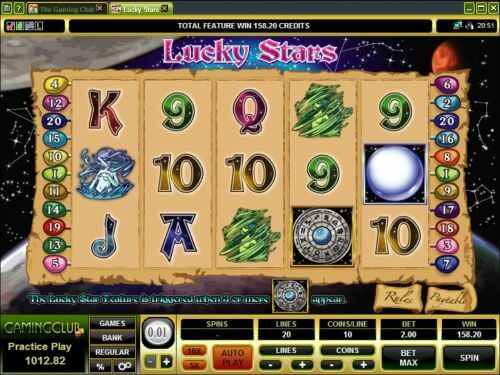 Lucky Stars is a 5-reel, 20-line video slot developed by Microgaming, featuring a wild symbol, scatter wins, a free spins feature and a bonus game. You can play the Lucky Stars video slot at Bovada. The Lucky Stars casino game is a penny slot. Coin values on the Lucky Stars slot machine are $0.01, $0.02, $0.05, $0.10, $0.20 and $0.25. You can select 1-20 paylines at 1-10 coins per line. The maximum total bet on the Lucky Stars online slot is $50 per spin. Lucky Stars has a decent betting range that will suit most slots players. To play the Lucky Stars video slot, select your bet and press the “Spin” button. To play all 20 lines at 10 coins per line, press the “Bet Max” button. The top-paying symbol on the Lucky Stars slot machine is the Globe symbol. If you land 5 Globe symbols on a selected payline, you will win the 10,000 coin top jackpot. The Globe symbol is a wild multiplier, which not only will substitute for all other symbols (excepting scatters), but it will double your winnings. The next highest paying symbol is the Earth symbol at up to 1500 coins. The scatter symbol on the Lucky Stars video slot is the Wheel symbol. If two or more Scattered Wheel symbols appear on the reels, you can win a scatter win of up to 200X your total bet. If three or more Scattered Wheels appear, you will trigger 7 free spins at a 3X multiplier. Choose your Star Sign from the list provided and spin the Zodiac Wheel. If the wheel lands on your Star Sign, you will be offered a bonus game or 15 free spins with a 3X multiplier. 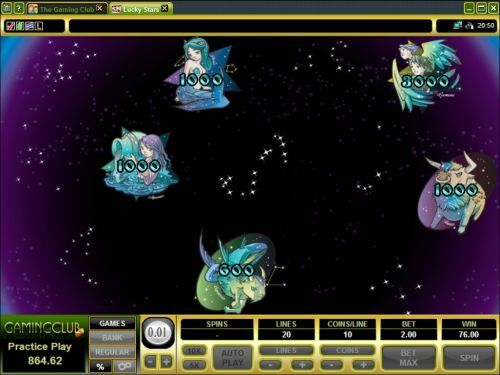 If you get to the Lucky Stars bonus game, you can select any 5 Constellations to reveal your cash prizes. If you do not spin your sign, you will be awarded 10X your triggering bet. Following the spin of the wheel, the free spins will begin to spin. The free spins feature cannot be re-triggered. Free spins are played at the lines and bet of the triggering spin. Free spins wins are added to payline and scatter wins. You can win big from this Lucky Stars feature when you play Lucky Stars at Bovada! Payouts are made according to the Paytable. Payline wins are multiplied by the bet per line. Scatter wins are multiplied by the total bet. Scatter wins are added to payline wins. All symbols pay left to right, except for the Scattered Wheel (which pays any). Only the highest win is paid per selected payline. Coinciding wins on different selected paylines are added. Lucky Stars has an autoplay feature with advanced settings. To use the autoplay mode on the Lucky Stars online slot machine, you must hit the “Expert” button. You can now play 5 or 10 autoplay spins. For advanced settings, hit the “AutoPlay” button and you can now play 5, 10, 25, 50, 100, 250 or 500 autoplay spins and stop autoplay if a win exceeds or equals $100, $500, $1000, $5000 or $9999. Autoplay will stop on any feature contained in the game. You can stop autoplay at any time on the Lucky Stars slot game. If you are someone whose interests consist of astrology, constellations, zodiacs, horoscopes and such, the Lucky Stars video slot will make for a great choice of slot games. Speaking of choices, it is one of the few that give you the choice between a bonus game or free spins. You can play the Lucky Stars video slot by signing up and making your deposit today at Bovada! Can American players play the Lucky Stars video slot for real money? No, American players cannot play the Lucky Stars online slot for real money at this time. USA players are welcome to play a great selection of USA-friendly slot games over at Bovada.